"The rain falls in four-four time. On pedestrians pounding pavement." Life as a musician is hard. Getting the big break is all it takes, but getting to that point is something that pushes aspiring musicians to make all sorts of decisions, some which aren't quite as good as others. 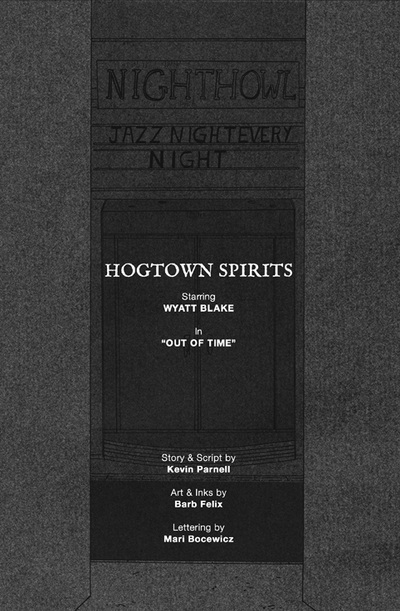 Hogtown Spirits #1: Wyatt Blake is a one-shot that boasts lost loves, unlucky characters and the pervasiveness of music throughout society as one guy seeks to get his break. The one-shot is written by Kevin Parnell and illustrated by Barb Felix. Wyatt Blake is a down-on-his-luck trumpeter who can't seem to catch a break. His latest woes involve the Nighthowl, a club that offers jazz every night that Wyatt is a part of, until he isn't. From there, Wyatt stumbles across his past on the streets of Hogtown as he struggles to find a way to survive. Wyatt got in deep with the wrong people, moving him to desperation when it comes to making a quick buck to stave off death. As a character, Wyatt is definitely believable. He makes his way through Hogtown with a sort of rhythmic flair that makes him stand out as more than just an average musician indebted to the wrong people. And through his narration, the reader is treated to his viewpoint, as he finds the beat in life around him; a byproduct of his devotion to music. Based on the description it's easy to assume the book will become another standard noir tale, but there's a certain bit of levity that can be appreciated in the form of Wyatt's former flame Silver. His trip down memory lane with her is carefully balanced with his survival instinct, prompting the book to flirt with a rather dark turn briefly before Wyatt comes to a broader realization. 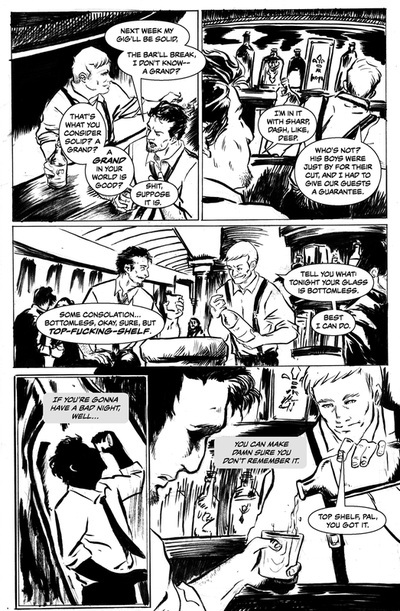 The end result is a character in Wyatt who somehow manages to grow a lot in the one-shot. 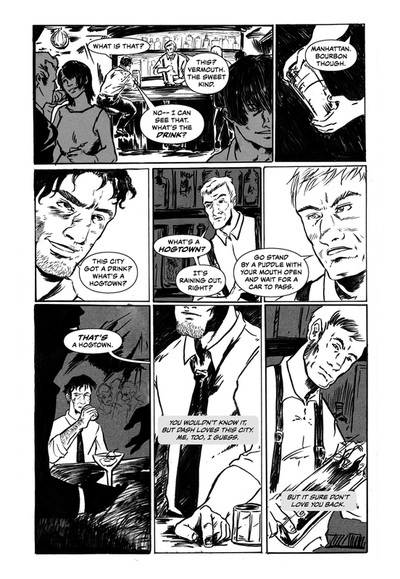 Where Hogtown Spirits #1: Wyatt Blake really delivers in the noir front is the art. 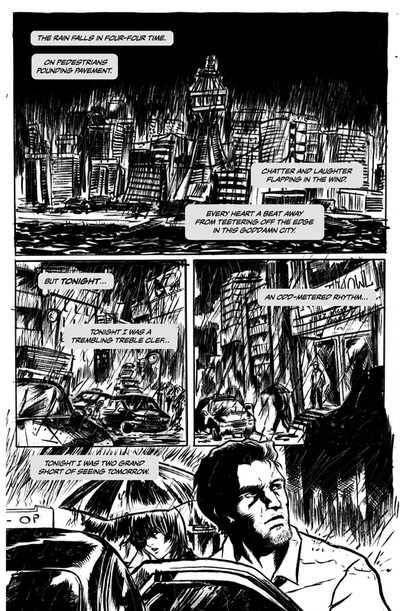 Felix's sketches accompany the tone of the book with a scratchy feel that really helps the reader feel as if they're visiting the somewhat grimy Hogtown along with Wyatt. 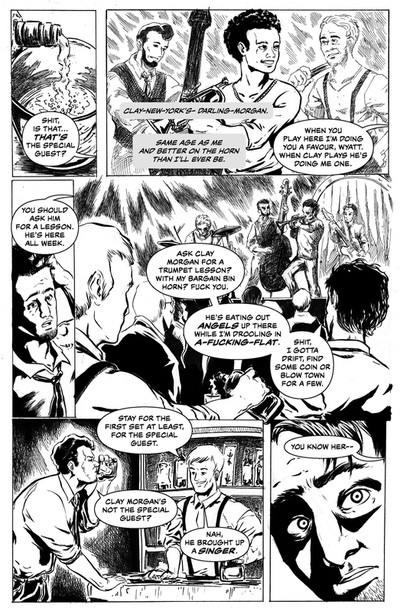 The way the characters are illustrated gives demands the full attention of the reader on them and their actions as well, ensuring the reader knows where to focus in each panel. There are a couple of pages that feature some pretty intricate and adventurous layouts, with the events progressing in panels overlaid on another single action. It's a great nod to the layering in music that gives a song depth and makes it feel active. 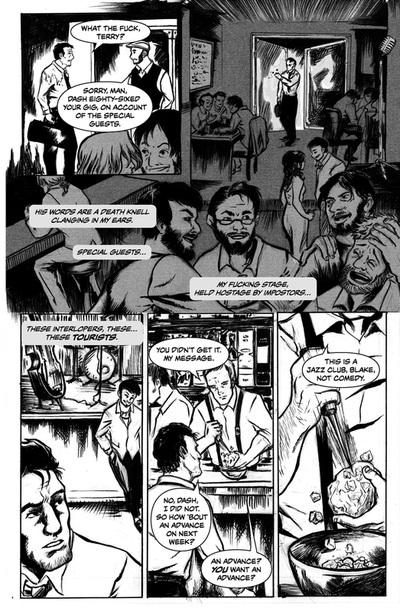 Hogtown Spirits #1: Wyatt Blake is a creative one-shot that infuses music into the traditionally coupled writing and art mediums. The result is a book that manages to delve into quite a few emotions and feelings, both on the part of Wyatt and in the reader. Parnell's tale bucks the expected when it comes to a story such as this, eschewing the traditional focus on the "bad guys" for time with the "good guy" and his bad luck. 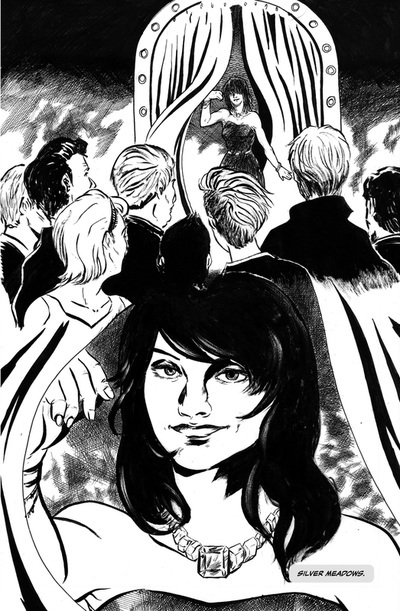 The approach taken by Felix on the art also hammers home the concept of Hogtown as a character, as well as gives other characters plenty of opportunity to showcase their personality traits in ways that inform the reader. 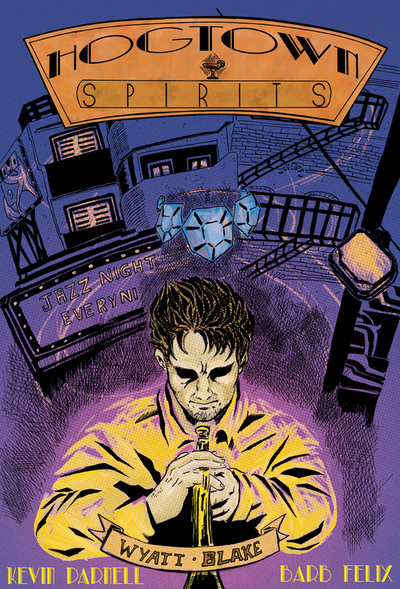 Hogtown Spirits #1: Wyatt Blake is a great one-shot that presents the subtle beauty of music against a backdrop of a town teeming with ugly personalities.